Bedford was, from its inception, a division of General Motors. The commercial companion to Vauxhall, Bedford’s light commercial vehicles were available from 1930 through 1991. 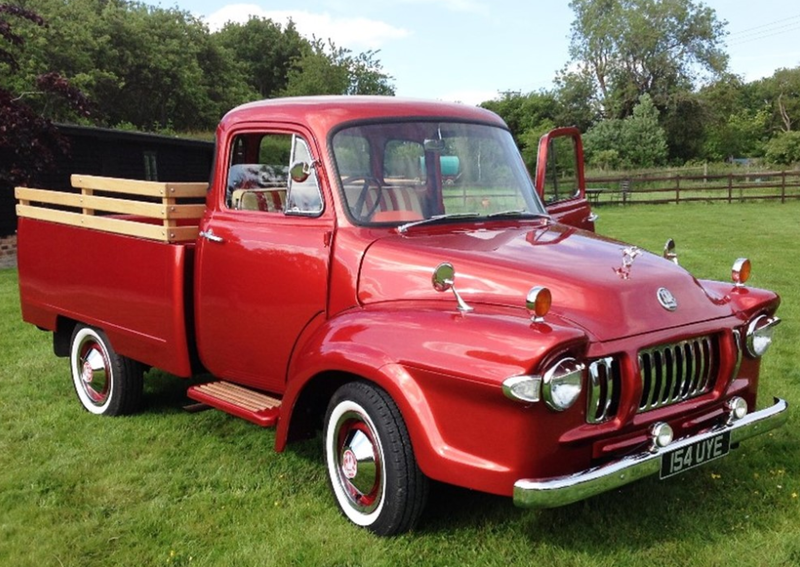 The Bedford TJ was a model sold as both a van and pickup truck from 1958 through 1967 (and through 1975 in other markets around the world). It was an updated version of the earlier TD. The JO (or J0), which was the ½-ton model, was the lightest of seven different TJs offered. Based on the lot description, it appears this truck uses a 2.6-liter straight-six. The styling on this thing is kind of wild, with a lot going on up front and a very plan looking box out back. It’s like the automotive equivalent of the reverse mullet. About 5,000 JOs were manufactured and only 20 are known to exist in the U.K. This one has been restored to what appears to be better-than-new condition. It was the 10th JO built and should bring between $60,000-$65,000. Click here for more info and here for more from this sale. Nash was one of the lucky few to survive the Depression and the War. Nash had a history of rugged vehicles but they never really got going with light duty trucks, though in 1946 they apparently experimented with just such a vehicle. This was a time when automakers were scrambling to produce cars and trucks America wanted after years of a stagnant auto industry. As you can tell, styling was certainly an important factor. It kind of reminds me of a Studebaker pickup of the era from the windshield on back. 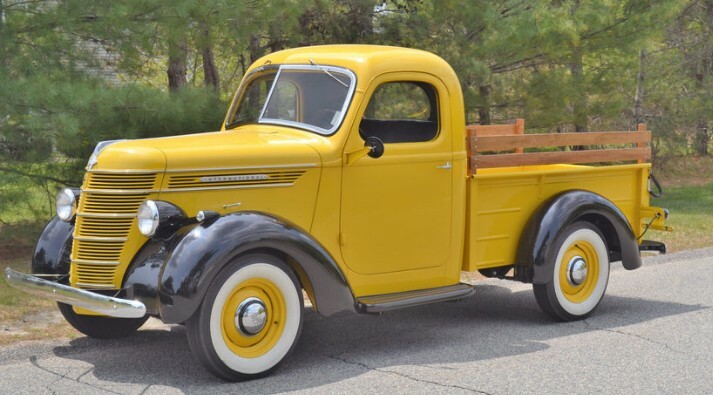 The front of the truck is clearly shares corporate styling cues from the Nash 600 and it’s powered by a 3.8-liter straight-six, which was likely installed during a comprehensive restoration and was probably not the engine it came with. It’s unclear how many of these Nash actually built (the possibility exists that it was more than one), but the catalog says that this is the only one in existence. It’s curious that it is in the U.K., but Nash may have exported any prototypes to shield themselves from liability issues. At any rate, the P1 never made it to production, making this a rare piece of American auto history. It will sell at no reserve with an expected result of $21,000-$35,000. Click here for more info and here for more from this sale. Casalini bills itself as the oldest microcar company in the world. Not the first, the oldest. They sold their first microcar in 1969 and are still selling tiny vehicles in Europe today. They built this thing – with slight modifications over time – from 1971 through 2000. Let’s talk about that name, “Sulky.” It seems like it would only by driven by depressed divorcees and people who just failed out of graduate school. Just imagine passing a parade of these things on the highway, all of the drivers sobbing and listening to Adele (okay, so a sulky is technically a type of one-seat horse-drawn carriage). This car is powered by a 50cc single-cylinder (later cars had 60cc singles then 250cc twins) situated above the rear wheels (which are driven). While the outside of this car looks a little rough, the photos of the engine compartment make it seem very clean, so it might actually be a runner. It will sell at no reserve and you can see more photos here. Innocenti’s fame stems mostly from their line of Lambretta scooters that sold like crazy in Italy after WWII. They built a lot of cars too, but the Lambretta name is more well known than Innocenti’s. 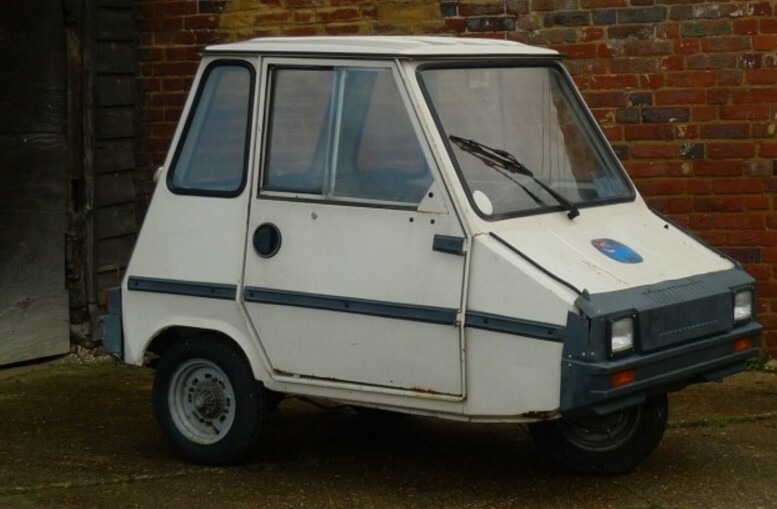 The first three-wheelers were badged as Lambrettas but later trucklets (there were vans too) were called the Innocenti Lambro. This pickup model has a 175cc single-cylinder engine making 7 horsepower. 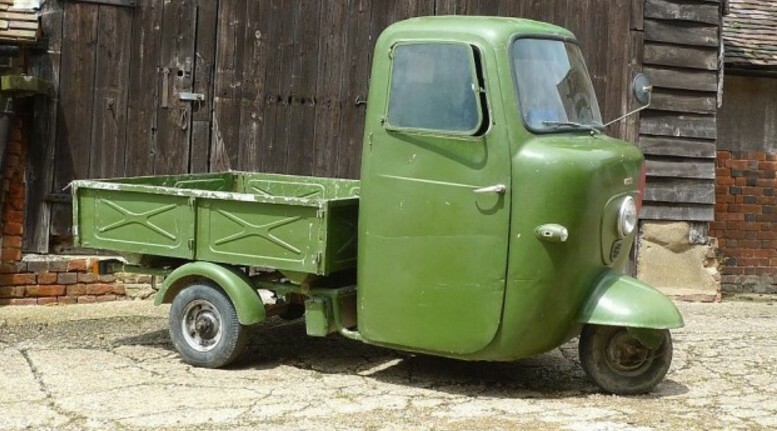 This vehicle is listed in the auction catalog as a “circa 1960 Innocenti Lambro”, which, when coupled with the engine size, raises some questions. If it’s truly an Innocenti Lambro, it would be a Lambro 175 model, which was built from 1963 through 1965. There were also Lambretta-badged pickups with a 175cc engine built from 1959 through 1963. The real giveaway is the badging on it which clearly makes it a Lambretta Li 175, likely a Series 2 model at that. Top speed is 38 mph in case you’re hellbent on setting land speed records. These aren’t seen too often today (especially outside of Italy) and this one, which is kind of rough, should sell for between $1,875-$2,500. Click here for more info. This is (at least) the third commercial vehicle produced by a motorcycle manufacturer that we’ve featured. 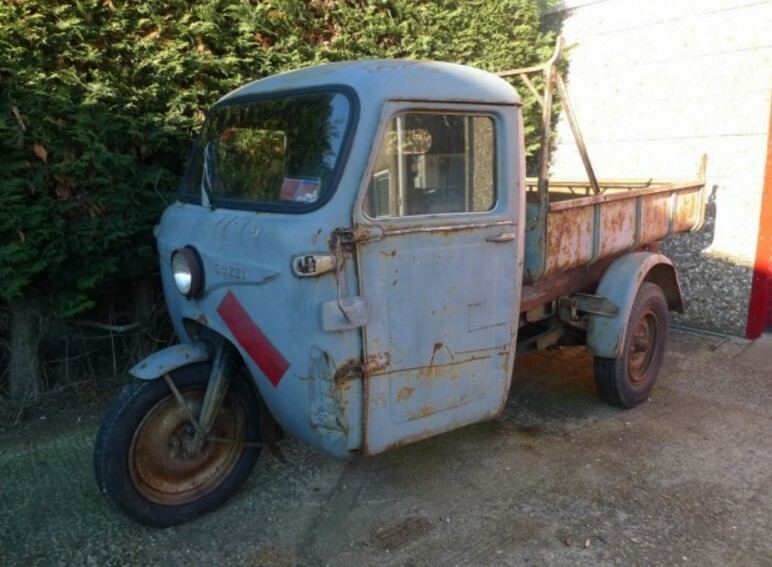 In the vein of the famous Vespa Ape and Lambretti Lambro, the Moto Guzzi Ercole is a scooter-based pickup truck (though this one seems larger). The Ercole was first introduced in 1946 by Moto Guzzi, Europe’s oldest continuously operating motorcycle manufacturer. The Ercole would be made through 1980 and this one is powered by a hefty 500cc single-cylinder engine. This three-wheeler is really just a motorcycle up front (the inside of the “passenger compartment” is literally just a motorcycle) with a steel cage wrapped around it. The rear pickup bed is a dumper, which is nice. It will sell at no reserve. Click here for more info. 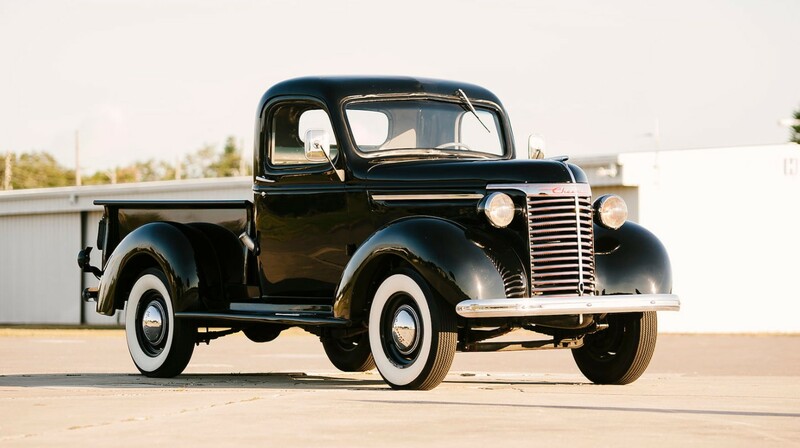 This gorgeous Art Deco pickup truck hails from the days of International Harvester’s “passenger car” production. 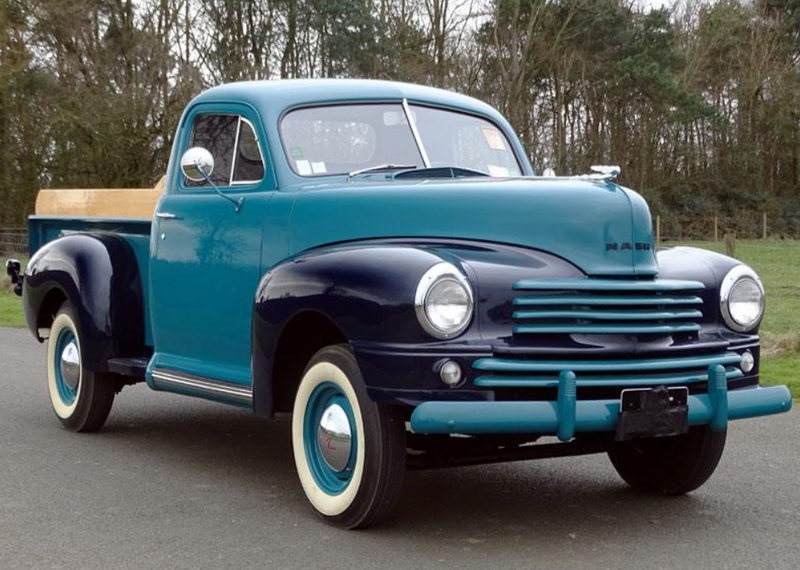 While they never actually built cars, they did offer light duty trucks – as opposed to their modern, exclusive focus on large commercial vehicles. The International D1 series dates back to 1933. The updated, Art Deco D2 came about in 1937 and lasted through the first half of the 1940 model year. 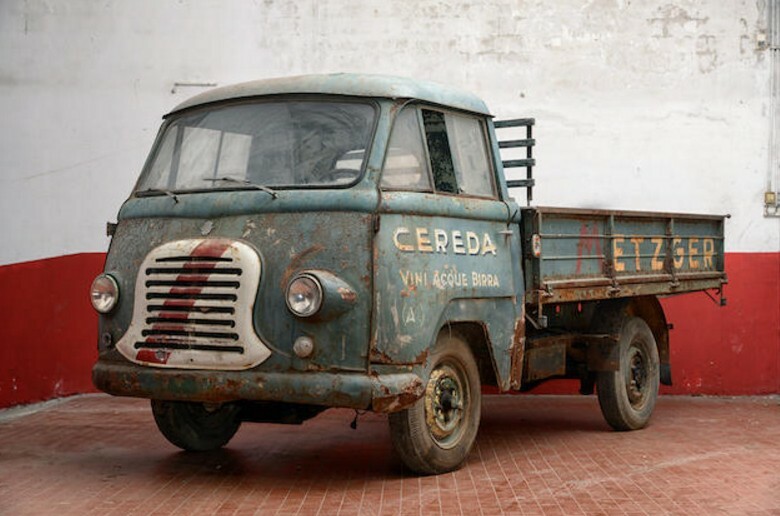 The D2 was the ½-ton truck and was available in two wheelbases. This is a short-wheelbase variant (as the LWB version was designated the D2H). It is powered by a 3.5-liter straight-six making 78 horsepower. This example has been beautifully restored and features a wonderful color combination. It was an AACA award-winner in the late-1990s. 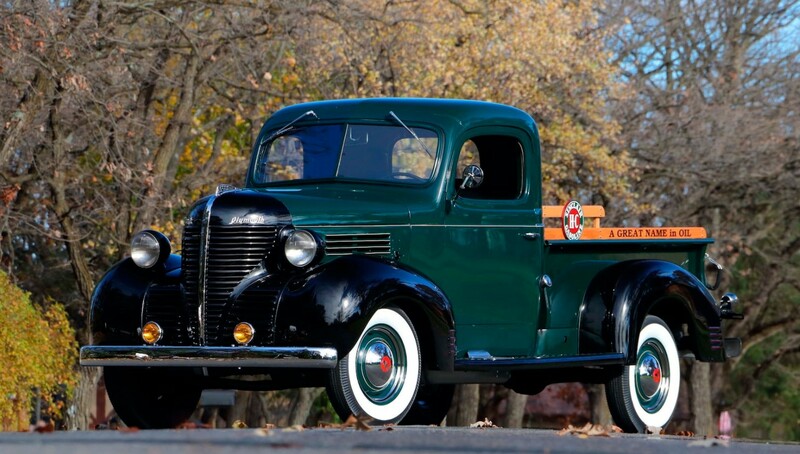 While Ford and Chevrolet trucks from this era are ubiquitous, this will turn heads when people realize what it is. It will bring more than it’s original sticker of $620. Click here for more info and here for more from this sale. Update: Not sold, high bid of $26,500. 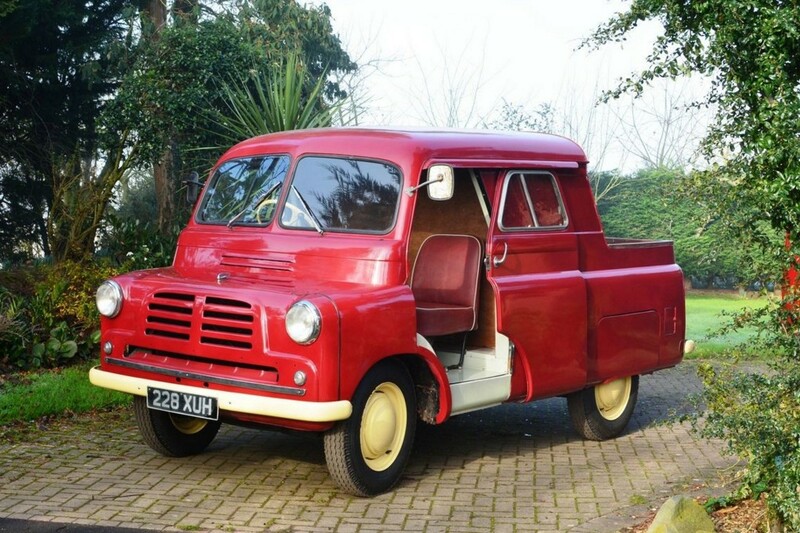 Bedford Vehicles was founded in 1930 and they built light and heavy commercial vehicles their entire existence. Did you know that the company was founded by General Motors as a sort of commercial sibling to Vauxhall? In fact, the first Bedfords were actually a Chevrolet model before becoming its own brand. GM divested itself of the heavy commercial vehicle part in 1987 and shuttered the light commercial vehicle brand name in 1991. The CA was a light van built between 1952 and 1969. All sorts of vans were offered – high-roof, low-roof, short and long wheelbases – even campervans. It was pug-nosed and a pickup was also available. But this is no ordinary pickup. This is the most spaceship-like pickup truck that has, perhaps, ever been built. It’s powered by a 1.5-liter straight-four making 52 horsepower. It’s not fast. But the styling is just so… unique. Yes it looks like the engine compartment was bolted on as an afterthought. Yes it has sliding doors like a Dodge Caravan. Yes part of the pickup bed is enclosed like a Chevy Avalanche minus the pass-through part. We. Love. It. It should bring between $8,500-$11,350. Click here for more info and here for more from Brightwells. 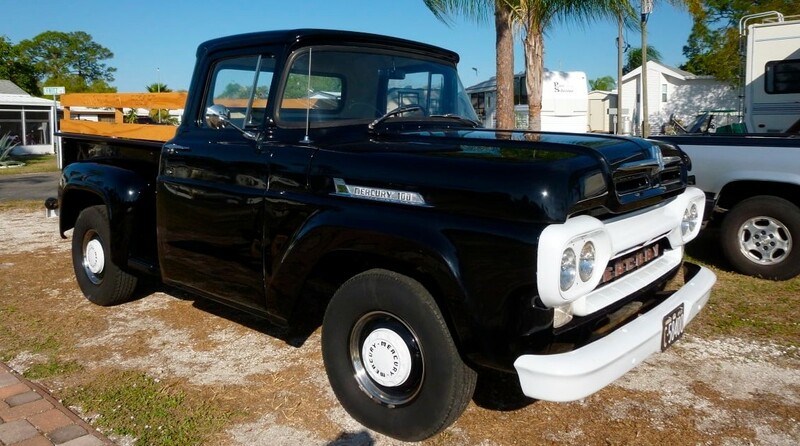 Light commercial vehicles – or everyday pickup trucks – are collectible because they’re cool and people grew up riding in them. And because they’re rare. 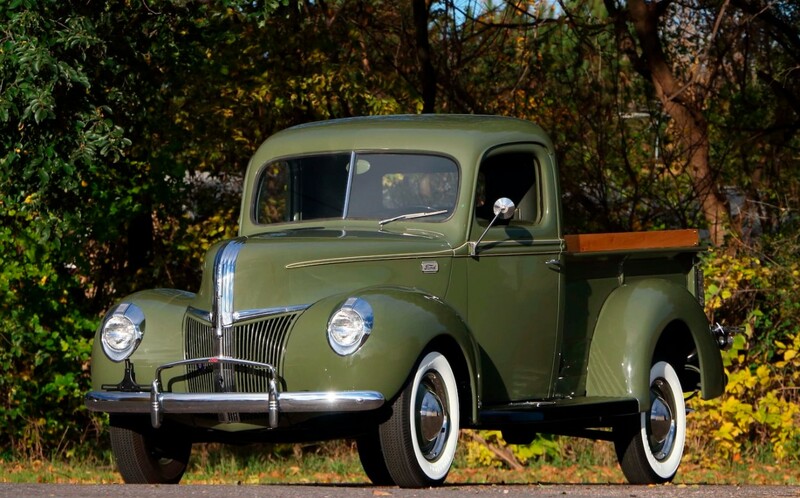 Pickups weren’t always a style icon like some people see them today. They used to be work trucks. Many didn’t survive. Especially those built in smaller numbers by lesser remembered manufacturers. International Harvester is still around, but they haven’t built passenger vehicles in decades. 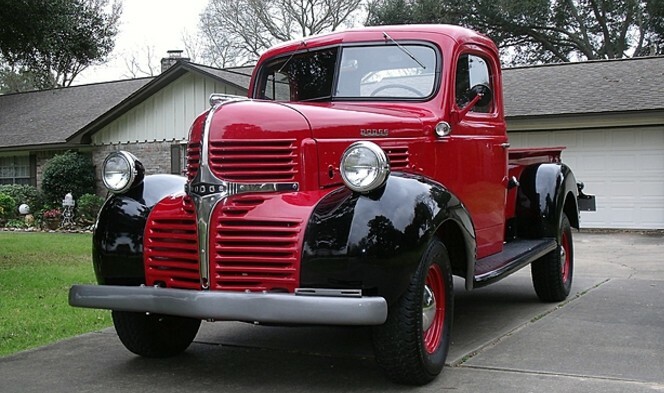 The R-Series line of pickups was built between 1953 and 1955. 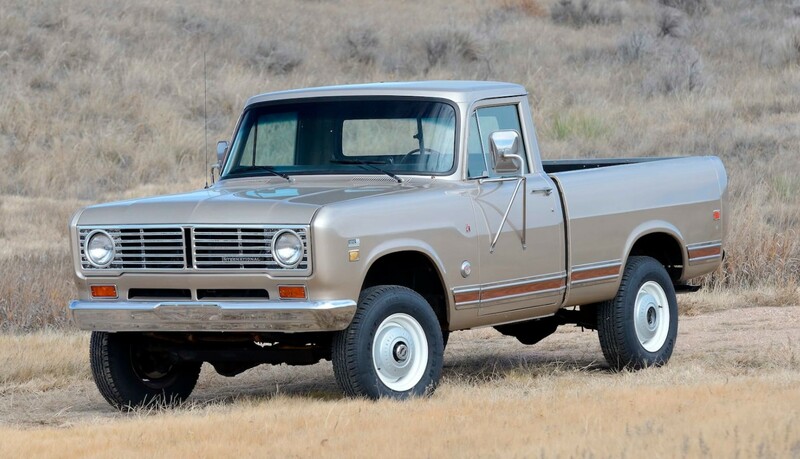 IHC would build series pickups through 1975. This truck is powered by a 3.6-liter straight-six making 104 horsepower. 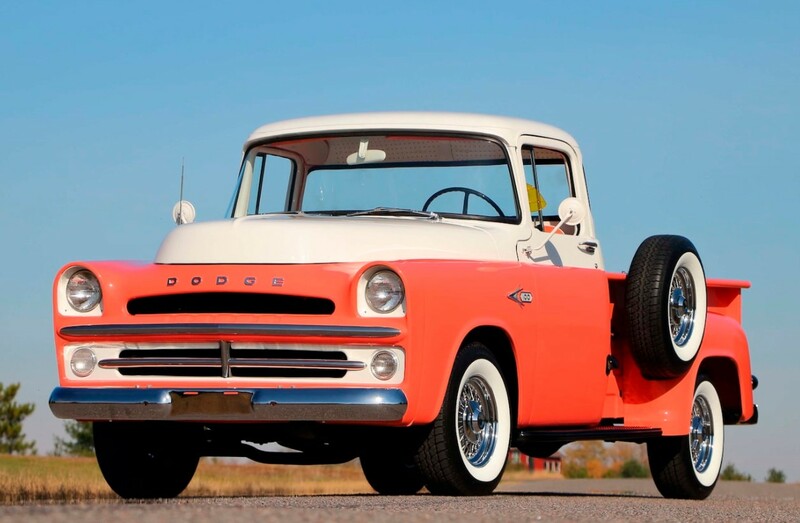 This truck was treated to a nut and bolt restoration and is painted in its original colors. 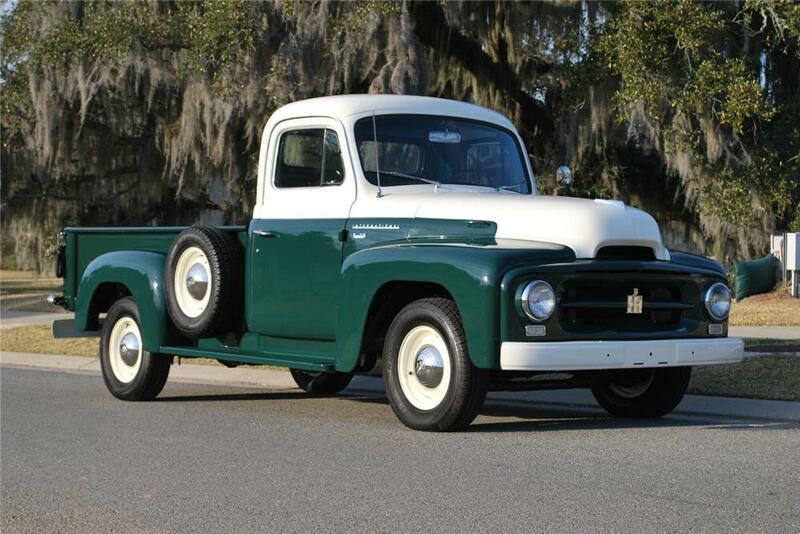 It’s a beautiful, clean truck that represents the base model for International trucks in 1954 (the R100 was new for ’54 and was $60 less expensive than the R-110 and had four more horsepower). It’s pretty nice. Read more here and check out the rest of Barrett-Jackson’s auction lineup here.